The large alternating currents which can not be sensed or passed through normal ammeters and current coils of wattmeters, energymeters can easily be measured by use of current transformers along with normal low range instruments. A transformer is a device which consists of two windings called primary and secondary. It transfers energy from one side to another with suitable change in the level of current or voltage. A current transformer basically has a primary coil of one or more turns of heavy cross-sectional area. In some, the bar carrying high current may act as a primary. 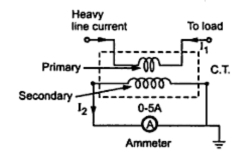 This is connected in series with the line carrying high current. The secondary of the transformer is made up of a large number of turns of fine wire having small cross-sectional area. This is usually rated for 5 A. This is connected to the coil of normal range ammeter. Symbolic representation of a current transformer is as shown in the Fig. 1. These transformers are basically step up transformers i.e. stepping up a voltage from primary to secondary. Thus the current reduces from primary to secondary. So from current point of view, these are step down transformers, stepping down the current value considerably from primary to secondary. As N2 is very high compared to N1, the ratio I1 to I2 is also very high for current transformers. Such a current ratio is indicated for representing the range of current transformer. For example, consider a 500 : 5 range then it indicates that C.T. Steps down the current from primary to secondary by a ratio 500 to 5. 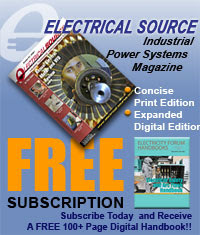 Example 1 : A 250 : 5, current transformer is used along with an ammeter. If ammeter reading is 2.7 A,. estimate the line current. So line current is 135 A. In wound type construction, the primary is wound for more than one full turn, on the core. The construction is shown in the Fig. 2. 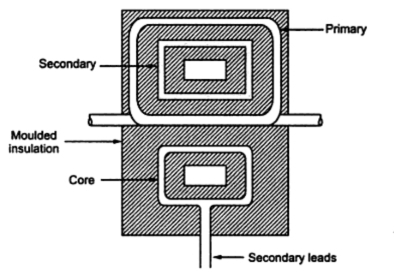 In a low voltage wound type current transformer, the secondary winding is wound on a backelite former. The heavy primary winding is directly wound on the top of the secondary winding with a suitable insulation in between the two. Otherwise the primary is wound completely separately and then tapped with suitable insulating material and assembled with the secondary on the core. The current transformers can be ring type or window type. Some commonly used shapes for the stampings of window type current transformers are shown in the Fig. 3. In this type of current transformer, the primary winding is nothing but a bar of suitable size. The construction is shown in the Fig. 4. The insulation on the bar types primary is bakelized paper tube or resin directly moulded on the bar. Such bar type primary is the integral part of the current transformer. 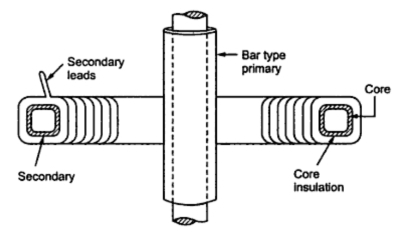 The core and the secondary windings are same in bar type transformer. The stampings used for the laminations in current transformers must have high cross-sectional area than the ordinary transformers. Due to this, the reluctance of the interleaved corners remains as low as possible. Hence the corresponding magnetizing current is also small. The windings are placed very close to each other so as to reduce the leakage reactance. To avoid the corona effcet, in bar type transformer, the external diameter of the tube is kept large. The windings are so designed that without damage, they can withstand short circuit forces which may caused due to short circuit in the circuit in which the current transformer is inseted. For small line voltages, the tap and varnish are used for insulation. 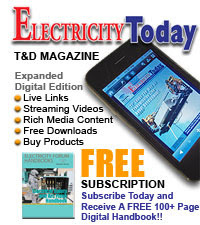 For line voltages above 7 kV the oil immersed or compound filled current transformers are used. 1.3 Why Secondary of C.T. Should not be Open ? It is very important that the secondary of C.T. should not be kept open. Either it should be shorted or must be connected in series with a low resistance coil such as current coils of wattmeter, coil of ammeter etc. If it is left open, then current through secondary becomes zero hence the ampere turns produced by secondary which generally oppose primary ampere turns becomes zero. As there is no counter m.m.f., unopposed primary m.m.f. (ampere turns) produce high flux in the core. This produces excessive core losses, heating the core beyond limits. Similarly heavy e.m.fs will be induced on the primary and secondary side. This may damage the insulation of the winding. This is danger from the operator point of view as well. It is usual to ground the C.T. on the secondary side to avoid a danger of sock to the operator. Hence never open the secondary winding circuit of a current transformer while its primary winding is energised. Thus most of the current transformers have a short circuit link or a switch at secondary terminals. When the primary is to be energised, the short circuit link must be closed so that there is no danger of ope circuit secondary. Superb Article.... Really i got lot of information on current transformers from your article thanks for posting such a nice post.